In 1823, on the basis of the tunnelling shield he had patented, Marc Brunel was approached to discuss the possibility of building a tunnel underneath the Thames. Two major attempts had already failed, but a group of investors were so impressed with the invention that they agreed to fund a third, if Marc would act as engineer. The Thames Tunnelling Company was incorporated by royal assent in July 1824. Marc Brunel moved his family from Chelsea to Blackfriars so as to live near the works and dispense with the office in Poultry. William Armstrong was appointed resident engineer under Marc with Isambard, then 18, acting as his assistant. Henry Maudslay built the vast tunnelling shield. The saga of the Thames Tunnel  the first significant sub-acqueous tunnel in the world  is one of the great dramas of civil engineering history. The project earned Marc Brunel his knighthood. It was also important in Isambard's life, although by the time the completed tunnel opened to the public on 25 March 1842, he no longer played a central role. However, for the first four years, the works were to consume  and very nearly kill  him. On 2 March 1825, the Company held a ceremony to launch the undertaking at the chosen site in Rotherhithe. Marc laid the first brick and Isambard the second. Within nine months, a great brick shaft had been sunk to the tunnel's starting level, the shield was installed and assembled and the slow advance towards the river began. The works began to take their toll almost immediately. Geological samples taken in the planning stages had seemed to indicate the presence of a band of London clay running below the Thames, and Marc had routed his tunnel accordingly. In the event, no band of clay was found. The stout tunnelling shield was able to support the waterlogged sand and gravel that makes up the river bed, but copious quantities of highly polluted water leaked through at each 4-inch advance. A horrible fever that caused blindness was rife amongst the workers and in November 1825, Marc too fell ill. By April 1826, Armstrong had had enough. he resigned his post and Isambard took charge. 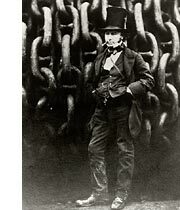 Throughout 1826, work on the tunnel proceeded at a painfully slow pace despite Brunel's dedication  he would regularly work shifts as long as 36 hours. Of his three assistants, one died of 'tunnel fever' and one was permanently blinded in one eye, and Brunel himself suffered a period of illness during the autumn of the year. But the real trouble started the following spring. The directors of the Thames Tunnelling Company had begun to recoup some of their investment by allowing paying visitors to view the works, to Marc Brunel's great apprehension. He was under no illusion about the state of the riverbed, through which shoes, buckles, rusted tools and other debris descended into the tunnel. High tide was particularly dangerous and it was on 18 May 1827, as the water was rising, that the Thames finally burst through. Miraculously, all men escaped, thanks in no small part to the quick actions of Isambard's assistant, Beamish, and the young engineer himself. It took half a year to clear the works of silt and water and to plug the hole with clay. Work began again in November but it was not long before disaster struck once more. On 12 January 1828, a second flood proved even more calamitous than the first. Six men were killed and Brunel, who had been working on one of the frames with two of the men who drowned, was saved only by sheer luck. His leg was badly crushed and he was knocked half unconscious, but the wave of flood water swept him towards an exit shaft and into the arms of the useful Beamish, who was rushing to the scene. Although he could no longer walk, it was two days before Isambard could be persuaded to leave the works. He was sent to Brighton to recuperate. His impatience did not help his recovery and he suffered various relapses, both in Brighton and back at home. While Isambard struggled with his injury, Marc struggled to little avail with the directors of the Company. Money was running out and the recent deaths and difficulties frightened them. Although Marc succeeded in getting the hole plugged and the site back in working order, in August 1828 the directors gave the order that the shield be bricked up and the works abandoned. And so they remained for eight years, by which time Isambard was tunnelling elsewhere, and using his own designs.